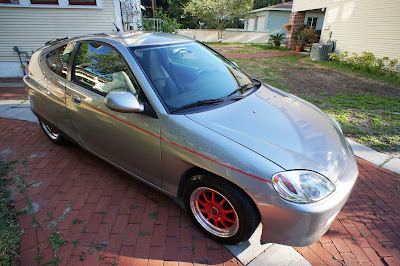 For years I've been the proud owner of a stock 2000 Insight that while amazingly thrifty has never provided much joy in the going-fast department. Averaging 70mpg on cross country jaunts has been fantastic but the only times the car ever truly brought me joy was at the gas pump. After a lifetime of owning various RX7's, Civic Si's, Datsun 240z's and Preludes this new paradigm of going slow was not fitting me well. 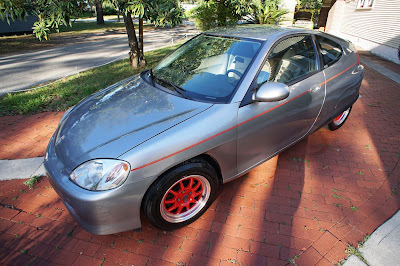 Then I discovered LHT Performance in St. Petersburg had made waves in the Honda community by swapping the K20a engine from a 220hp Acura RSX R with its 6 speed transmission and limited slip differential into the tiny Insight making the sleepiest sleeper I'd ever seen. And I really wanted one ... but ... I'd need $21,000 and a different car for the K20 engine swap. My Insight is a rare one of 400 1st year model in 'Citron' green so to do this swap I'd need another Insight and an additional twenty one thousand dollars. Notably, I had neither. 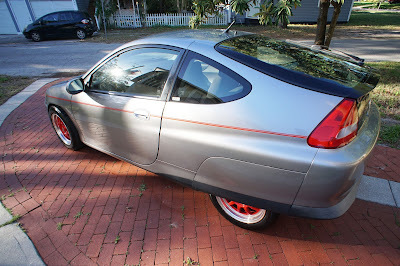 Three years ago I discovered a K20 Honda Insight auction on Ebay in Connecticut that was less than 24 hours from ending. Keep in mind that I'd been looking for years. The price was manageable, less than a LHT production without the cost of a donor. With a blizzard barreling towards Connecticut and with little time to prepare I had to skip a pre-purchase inspection and just bid on it, hope I'd win and then fly there. Luckily I was not outbid thanks to the poorly worded auction title: "Honda Insight Custom Modified" with no mention of the K20. I bought a flight on Southwest and was there a day later. The seller was an agent for the owner so he knew few specifics about the Insight. I would have to go on instinct as in-depth questions were not an option. I did find a shop to run a compression check and there was no deviation from cylinder to cylinder and they found no glaring faults or signs of previous accident damages so I felt confident enough to pay and hit the road: 1800 miles back to Austin with a blizzard just beginning to hit. I stopped by a transmission shop to double check that the transmission was fully topped off with oil as the whir of the helical cut gears was slightly audible - but the engine is perched on urethane mounts that transmit noises I'm not used to hearing in my stock Insight. Everything checked out fine and my trip was pleasant. Sixth gear cruising on the interstate is sedate and little engine noise intrudes into the cabin. Passes need no downshift, a very odd sensation after years with a stock Insight. Reprogramming myself to drive a close ratio 6-speed was not easy. My muscle memory is mapped to five gears and I have to be very deliberate in shifting, even making a mental note 'I'm in 4th gear' etc. 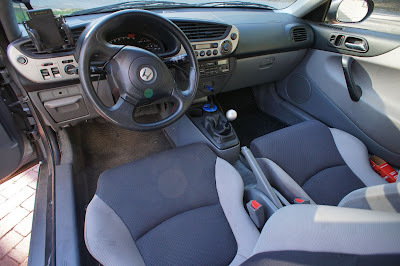 The shifter is a short throw, but adjustable. It feels like shifting a toggle switch. 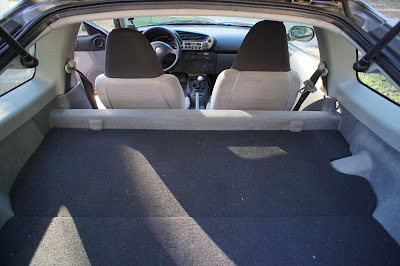 Unnerving also is the clutch - which is now perhaps three or four times harder than the fly-weight stock Insight. Since then we've moved to Tampa FL. 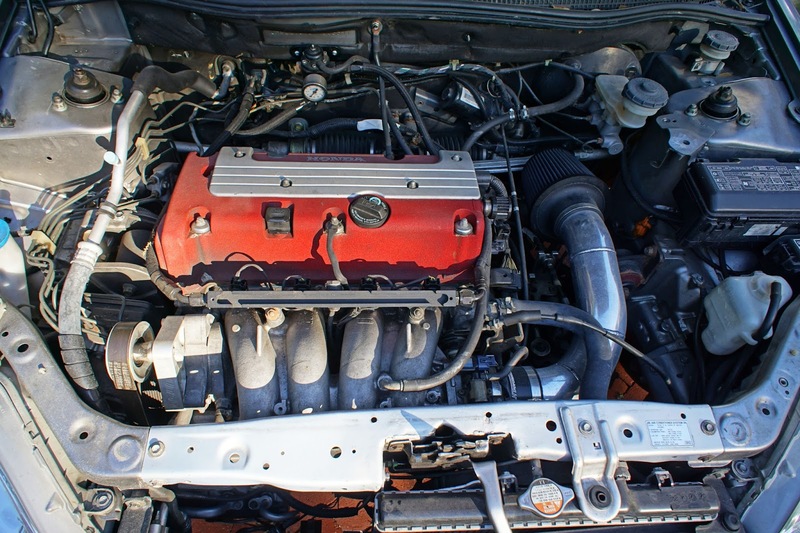 We're now 20 minutes from LHT Performance, the masterminds behind the original K20 Insight swap. 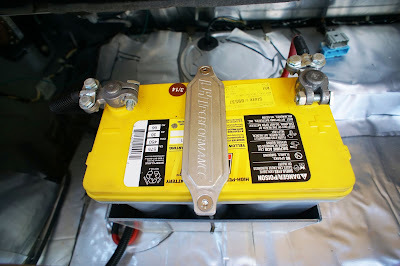 LHT have done work on the car since our arrival, swapping in a new AC compressor and some other minor updates like moving the battery to the hatch area and diagnosing/fixing an engine grounding issue. John, the Australian madman behind their automotive mayhem is an affable, down to earth guy who's an engineering whiz. George, his right-hand man is a fantastic enabler. As you might imagine, driving this car is like driving a cannonball. 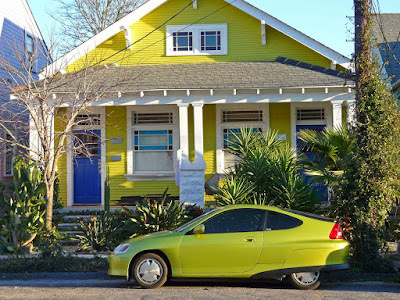 When the Vtec activates all kinds of pandemonium occurs, the otherwise tractable and quiet car screams like a superbike and the steering, thanks to the limited slip differential generally goes where it's pointed while the tires attempt to transfer torque to pavement. Recently we encountered a BMW Z4-M in traffic being driven by a jackass, swerving from lane to lane on one of Tampa's wide boulevards by the airport. He made some poor lane choices and caught the last red light before a long straightaway with no side streets, with us behind him. He was an older middle aged guy with a much younger woman he was trying to impress. I knew he'd gun it on the green - unaware of the menace behind him. The loud snarl of the K20 had him quickly checking his mirrors in disbelief. We hit 120 mph with no change in distance from where we'd sat at the light - he was shifting past his redline with puffs of smoke between his shifts, then back on the brakes for the next light where he made an impromptu right turn rather than have another embarrassing moment at the hands of a hybrid economy car. I don't make a habit of this, but sometimes you have to do what you have to do. I've owned the car for a few years now and hardly driven it. There was a big move, a change of priorities and a lot of life in that time span that prevented me from enjoying it. Combine that with my stock Insight daily driver, a Subaru Legacy wagon and my TR6 and you might understand that I don't really need it. I don't have the temperament to drive such an insane car. I despise and loathe attention from the police and my driving record has been spotless for over eight years now - and I aim to keep it that way. But not if I continue driving this absurd rocket-pod. My knees are knocking together literally every time I get out of it. If you want what's essentially a snarling superbike on four wheels, it's for you. As stated, LHT Performance will charge you $21,000 - PLUS whatever you paid for the Insight that you want converted to K20 power. I'm selling mine for $12,500 total or less if you have an interesting trade on a classic Datsun 240/260/280z. 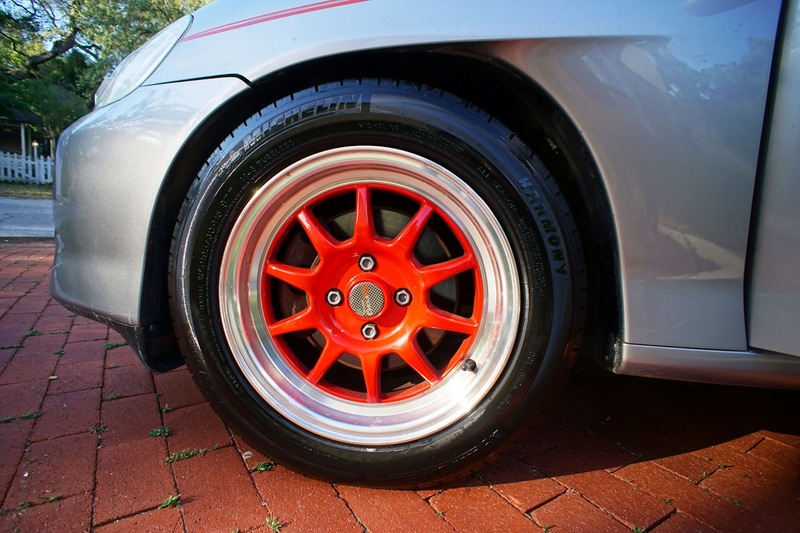 It has larger Integra front rotors and red 15" alloy wheels that currently wear 195/60 all season tires that are a good winter compound but which I'd upgrade to a summer track tire if I were keeping it. It's fairly quiet until the v-tech sings the song of its people whereupon all hell breaks loose. Hold on tight to the steering wheel. The stereo is the stock Honda cassette unit with a factory cd changer in the hatch. No smoke, no oil consumption, no odd noises. Caveats are slightly odd silver paint on the hood's front that most people don't notice, an electrical slow drain that I've never taken the time to track down but which would be a non-problem if it was daily driven. The auction stated mileage as 55,000 but that was the what the S2000 gauge cluster indicated. The seller said it was more but it's not evident to my eyes. The car is close to flawless and ding free. The mileage of the engine is unknown as it was a Japanese market engine shipped over on a pallet. The vast majority of these engine pulls are from low mile JDM cars for various weird Japanese regulatory reasons. Bad for them, good for us. So that's it. I've had my fun. Now I want another Datsun 240z like the one I drove in college. It's your turn to lay down pain and agonizing defeat upon unsuspecting drivers in prestigious cars - and put the fear of god into the next douche who attempts to roll coal on the little hybrid car. Ask me how I know. Here's the photos so far on Flickr in high resolution for you to poke with a stick. Enjoy! You can reach me by clicking on my profile or by emailing dsanborn at gmail dot com. For anyone preferring to repost the Craigslist advert, here it is. Car Wreckers,. Cash for Cars Brisbane & Cash for Scrap Car Gold Coast. SELL MY CAR Buy Unregistered, Damaged, Scrap, Old, Unwanted, Used Cars for Cash. Very useful blog keep it up. Please share more details about Honda insight. Thanks for sharing.